The images are dark. Rwanda. Who can forget the movie Hotel Rwanda and the bumpy road that turned out to be strewn with bodies? And yes, the genocide did happen and has scarred the psyches of three or more generations of Rwandans forever. It is a shadow – and it is everywhere in Rwanda. I could write more about this era of history, however there is so much more to Rwanda. I want to write instead about my amazement. For Rwanda is beautiful and green, hilly, and COOL – mountain weather as it used to be before the days of pollution everywhere. People say there is no such thing as a bad view in the city of Kigali; there are panoramic views everywhere. The streets are clean, buildings and gardens well cared for. My first day in Rwanda, a Sunday, I took a walk before breakfast and couldn’t stop smiling: people on the street were good looking, well dressed, the men mostly in Western style shirts and ties or suit jackets, and the women in long dresses of bright African prints. There was a magical energy and spirit in the air. And in truth this is a peaceful, progressive country. Children across the country are in school. All families with children have rudimentary medical insurance, provided by the government for families too poor to buy their own. Kigali is a modern city with several big hotels, banks, government buildings, hospitals and clinics, and a host of good restaurants. But there is much to do in the countryside. Here people are poor and “city services” which we may take for granted, like electricity and clean water, are nonexistent. Few women are educated, and gender-based violence and discrimination are still prevalent. Women for Women International, the incredible NGO that hosted my trip, works with the women in the countryside, choosing the most disadvantaged and impoverished of women. They started working in Rwanda 20 years ago, soon after the Genocide ended. They put together groups of 25 women for each year-long program, meet women two or three times a week, near their homes, and teach them an empowering curriculum, which includes classes about their health, their rights, business, numeracy and literacy skills, and a vocational skill. 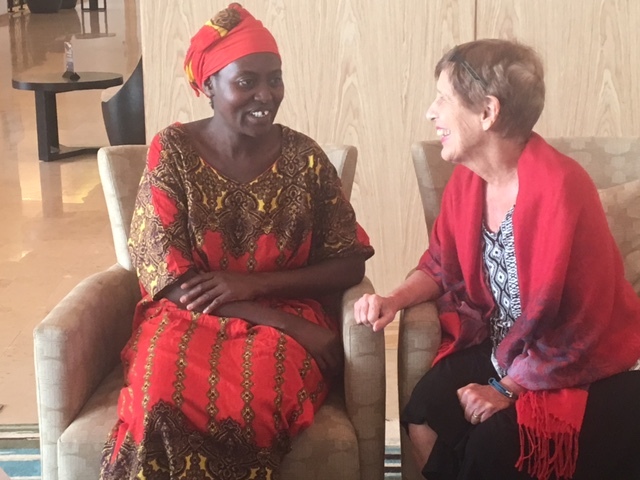 Susan meets her sister, the Rwandan woman she sponsors through WfWI. The team I was traveling with was invited to listen in to one class in which the women were talking about ways people sometimes wasted money. One woman said “Well, suppose you have a very ugly husband whom you don’t like, and you want to buy little trinkets for a much better looking man you know!” This drew chuckles – who knows how serious it was meant to be! Perhaps more realistically she added that sometimes she sees a friend has a nice new dress, and she wants to spend money for something like that. Or she smells that a neighbor is frying potatoes and she rushes out to buy oil on credit so she can do the same. Through a men’s engagement program, Women for Women International works with men under certain circumstances too, for if men will not cooperate, do not want their wives to participate, maybe even forbid them to leave the house for classes, women will not be able to sustain their participation. We witnessed one men’s discussion group in which the men openly said that this had been a big change that had gone down with real difficulty, but they were happy that their wives were now partners in the family and felt the situation was good. We had one man in our group, the husband of a WfWI board member, and he told the group he was happy his wife worked, and pointed out that some years she made more money than he did. This testimony really impressed the men! Perhaps the most urgently needed part of the Women for Women curriculum is devoted to livelihood: teaching skills, forming cooperatives, and women working together to earn and save money. Here women go way beyond the traditional women’s work of handicrafts – although they are producing wonderful baskets and the traditional cow dung decoration called Imigongo. 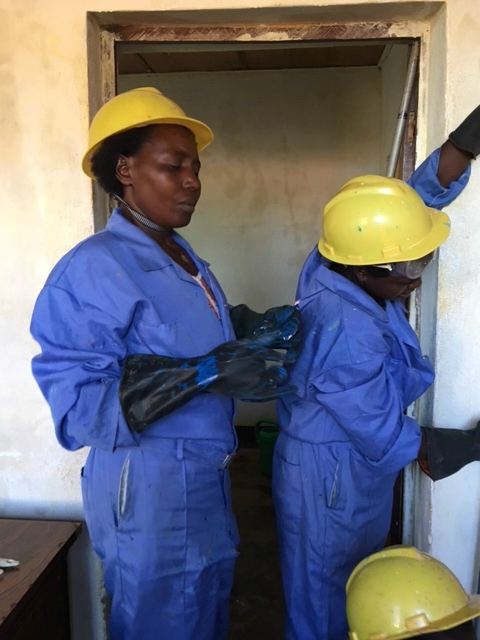 We visited one group of women who have formed a brick making cooperative and are making first class bricks, and another group engaged in house painting. Women also farm; we were put to work helping the carrot farmers one morning. At the Urugo Women’s Opportunity Center, we met one group of women making and marketing high quality yoghurt. There was a graduation on the last day of our visit: 600 women, all dressed up and beaming with pride as they presented the fruits of their labor, danced and celebrated. One mixed group of men and women presented a comic dance in which the men gamely took over all the work of the women, so the women could go to school! For us this served as a wonderful celebration of the good work done by Women for Women International – and of the progress coming to beautiful Rwanda. One woman at a time. Susan Evangelista is a writer and educator who has lived in the Philippines her entire adult life. She taught in the Ateneo de Manila for 30 years and then retired to Palawan – and began teaching again. She and her daughter Amina co-founded Roots of Health, a non-profit that works to provide reproductive health education and clinical services to women and girls in Palawan. Susan also writes narrative nonfiction and fiction. Feature image courtesy of Hazel Thompson. Others images courtesy of Susan Evangelista. A shorter version of this piece first appeared on Palawan News.